With a heavy heart I'm posting the loss of an excellent steel player, great friend and wonderful man. Mike Meese of Dover Ohio passed away Friday, January 19 2018. No details are available at this time. Cause of death may have been heart attack. Only speculation at this point. Mike was always a huge part of the Hummingbird Steel Celebrations as well as having his own band and supporting local music and especially the steel guitar. Mike was loved by many and will be remembered for his calm spirit and joyous smile.Always the jokester and slow to anger. I miss you already my friend. Go rest high. We have lost a great steel player & our hearts go out to Tracy & family, always loved his infectious smile. Praying for strength for the family during this difficult time. Terrible, sad news. Our prayers go out to Mike's family and friends. I'm sorry to hear this news and send my condolences to his family and close friends. 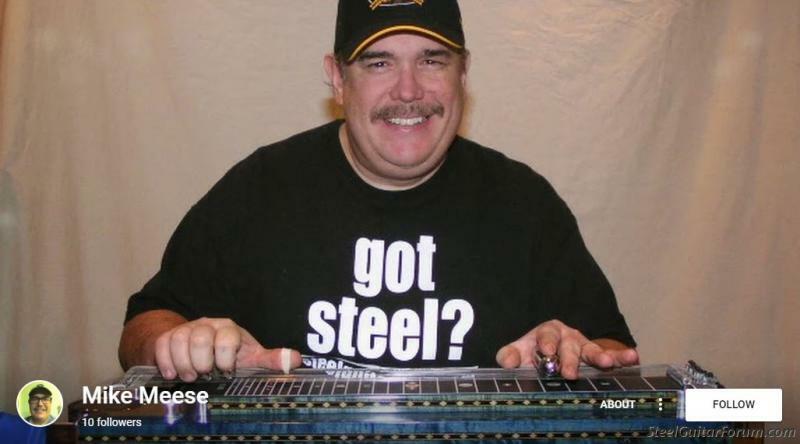 I didn't know Mike well but saw him at many steel guitar shows and conventions. I will never forget his open, friendly smile that never seemed to leave his face; a good lesson for all of us about how to make the lives of others a little bit brighter. Rest in peace, Mike; you left us too soon. I am so sad to hear of mikes passing. What a great friend & player. I'll see you soon ole friend. Sad news indeed! I only knew Mike from crossing paths occasionally doing club work some years ago - he always had a good word to say and was a great steel player! Rest in Pease my friend. Such bad news, Mike was a great friend. He will be so missed! Had many wonderful times with him and his wife Tracey. Rest in peace my friend! Our thoughts and prayers are with the family and friends. My prayers and thoughts are sent out for his family and close friends. Sorry to hear this, Rick. I know you and several others Ohio steelers posting here were great friends with Mike. I had the pleasure of meeting him a time or two myself. Just found out about Mike's passing. So sorry about the loss! He will be missed.